A native of Syracuse, NY, Army Lieutenant General Keith B. Alexander has served as the director of the National Security Agency since August 2005. In this role, Alexander also serves as chief of the Central Security Service (NSA/CSS) and commander of the Joint Functional Component Command - Network Warfare (JFCC-NW) at Fort George G. Meade in Maryland. As the director of NSA and chief of CSS, he is responsible for a Department of Defense agency with national foreign intelligence and combat support responsibilities. As commander of JFCC-NW, he is responsible for planning, executing and managing forces for coordinating DoD computer network defense as directed by US Strategic Command. Alexander holds a Bachelor of Science degree from the US Military Academy and a Master of Science degree in business administration from Boston University. He holds a Master of Science degree in systems technology (electronic warfare) and a Master of Science degree in physics from the Naval Post Graduate School. He also holds a Master of Science degree in national security strategy from the National Defense University. Alexander’s military education includes the Armor Officer Basic Course, the Military Intelligence Officer Advanced Course, the US Army Command and General Staff College and the National War College. Alexander’s military commands include serving as G-2 for the 1st Armored Division both in Germany and Operations Desert Shield and Desert Storm in Saudi Arabia; S-3 and executive officer for the 522nd MI Battalion, 2nd Armored Division; and as deputy director and operations officer for the Army Intelligence Master Plan for the Deputy Chief of Staff for Intelligence. His command assignments include tours in Germany and the US as commander of the Border Field Office for the 511th MI (Military Intelligence) Battalion in the 66th MI Group; the 336th Army Security Agency Company in the 525th MI Group; the 204th MI Battalion; and the 525th MI Brigade. 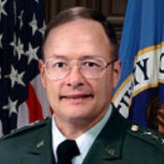 In 1997-1998, Alexander served as deputy director for intelligence (J2) for the Joint Staff. From 1998 to 2001, he served as director for intelligence (J2) for the United States Central Command. From 2001 to 2003, he held the US Army Intelligence and Security Command and, most recently, he served as deputy chief of staff (G2) for the US Army from 2003 until assuming command of the NSA.